Ugandan comedian Collins Bareija best known as Emeka (m) and other comedians will be performing live in Lusaka, Zambia. 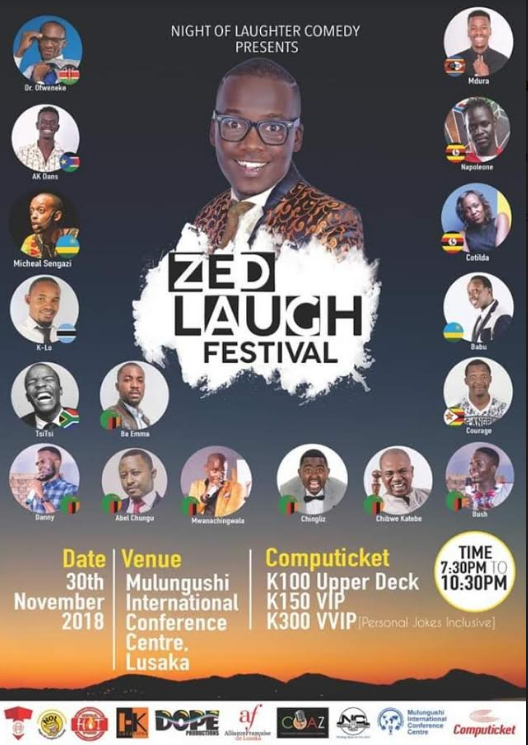 LUSAKA– Uganda’s comedian Collins Bareija Magezi, alias Emeka will perform at the Zed laugh Festival at Mulungushi International Conference Centre, Lusaka Zambia on Friday, November 30, 2018. ZED laugh festival is Zambia’s biggest comedy show hosted by Chingliz Zambia’s funniest man. The Show will feature cream de – la cream comedians from over 10 countries that include; Uganda, Rwanda, Burundi, Kenya, Botswana, South Africa, Swaziland, South Sudan, and Zimbabwe. Emeka will be accompanied with other Ugandan comedians such as Cotilda and Napoleone Emmah. Unlike many comedians, Emeka joined the comedy Industry in 2014 and never looked back. He has featured at both local and international shows that include: Churchill show in Kenya and Kigali International comedy in Rwanda. He has also been nominated at the ADARA awards in South Africa for African Comedian of the year alongside Salvador and Basketmouth and among others.